AKG K52 review | What Hi-Fi? For some time now, AKG has been the king of affordable headphones. From the AKG K451 to the AKG Y50 (£50), the last five years have seen the company pick up a string of What Hi-Fi? Awards. The AKG K52 over-ears are the latest budget headphones to win us over. At £30, the K52s sit on the cheapest end of a new line, followed closely by the K72 (£40) and the K92 (£50). Price-wise, the closest competition would seem to come from within – the Award-winning Y50s. But they are a completely different proposition. Whereas the Y50s are a portable on-ear pair, the K52s are designed for home use. They don’t fold up, nor are there any in-line remote controls. The over-ear design is surprisingly light. Despite its low price, no part of the headphones’ construction feels poorly made. They feel durable, too, which is a rare thing for such a budget price. The AKG K52 headphones have a metal frame that's sturdy but remains lightweight. The headband isn’t adjustable; instead there’s a flexible, cushioned band that springs into place around your head. There’s plenty of give, but even with the large earcups the headphones stay firmly put on your head. The AKG's earcups enclose the ears fully. The ample padding around them is soft, and it doesn’t make your ears warm over long periods of listening. They clamp down on your head firmly, but not too much – just enough to make sure the headphones don’t fall off. There's a 2.5m cable that ends in a 3.5mm plug, but don’t worry about being restricted to using the headphones with your laptop or smartphone, they come with a 6.3mm adapter so you can plug them straight into your hi-fi system as well. 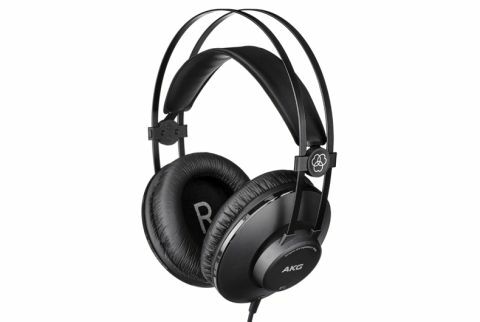 We start listening to the AKG K52s and have to double check that these aren’t open-backed headphones. They’re the most airy-sounding closed-backs we’ve heard at this price. There’s a great deal of space for the piano notes in Birdy’s Shelter to flourish. Notes hit solidly, with enough detail and harmonies to keep you engaged. You can hear a good deal of nuances in her singing, from the lilts to the way her voice strains when hitting the high notes. The headphones are so evenly balanced that we could listen to them for hours without ever getting tired. There are no bright edges or booming basslines. The funky, rocking vibe of Lenny Kravitz’s Are You Gonna Go My Way comes across through the AKG K52s. The drums are lively and hit with snappy timing. Guitars sound crunchy and have a nice amount of weight and muscle underpinning each strum. The instruments don’t overcrowd the vocals, either. The rhythm is agile and full of energy. There could be more to the way the K52s handles dynamics, but it’s enjoyable enough. The shape of basslines and edges of notes are clean and taut in Sbtrkt’s Wildfire, and there’s a remarkable amount of control for the price. Sure, in absolute terms, there could be more subtlety in every aspect of the performance, but we have to hastily remind ourselves that the K52s only cost £30. We struggle to think of any other headphones at this price that perform so maturely. The AKG Y50s aren’t an exact comparison, but if you’re curious: the K52s are a bigger, clearer sound with a more articulate presentation. The Y50s naturally sound more closed-in and forward – they’re a punchy pair. But they cost £20 more than the K52s. We’ve yet to review the AKG K52s pricier siblings, the K72 and K92, so with only a tenner between the three pairs in this range, we can’t crown the K52s as the best value-for-money headphones bar none just yet. But they’re sure to come pretty close. The £17 Sennheiser HD201 headphones surprised us but for just £30, these AKGs are even more impressive. The sound quality is well beyond what you’d expect for this price – it’s enjoyable, easy to listen to, and there’s plenty of clarity, detail and agility. If you know you’ll be wearing the headphones indoors more than out, and are on a strict budget, the AKG K52s are one of the easiest recommendations we’ve made.